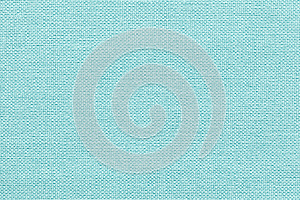 Light Blue Background From A Textile Material With Wicker Pattern, Closeup. Photo title: Light blue background from a textile material with wicker pattern, closeup. Light blue background from a textile material with wicker pattern, closeup. Structure of the pastel turquoise fabric with natural texture. Cloth backdrop.